We don’t live in a perfect world, and sometimes the systems and assets we operate fail. This can’t be avoided completely, but there are ways to mitigate the impact of downtime. A big step towards this is understanding system availability—the probability that a system is functioning when needed, under normal operating conditions. How do you calculate availability? Availability calculations do not include preventive maintenance downtime. To increase availability we can either increase the average time interval between repairs (MTBF) or decrease the amount of time spent doing the repair (MTTR). 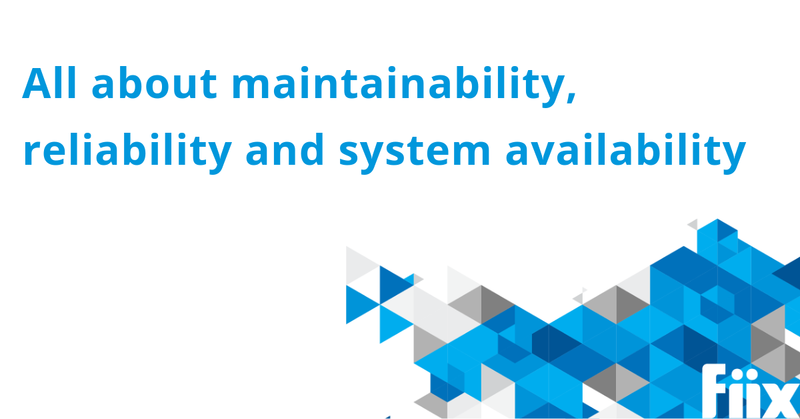 Understanding how maintainability and reliability affect system availability is key in maximizing it. However, we must do this in a cost effective manner since it’s not possible to keep pumping capital into improving availability and expect linear returns. Maintainability is how easy it is to restore a piece of equipment to a functional state. It determines how easy it is to isolate bugs or problems within a system, and preform the repairs. As much as maintainability comes down to technical aspects, there’s definitely a human component as well. MTTR—how long it takes technicians to get an asset back online after a breakdown—is a big factor in maintainability, and things like training, knowledge sharing, standard procedures, and checklists can be very influential here. Since many of these actions can be tracked in a computerized maintenance management system, this software can play a large part in improving maintainability. System reliability is the probability that an asset will be able to execute a failure free operation for a managed period of time within normal operating conditions. When reliability gets away from you, it can have a knock-on effect that impacts the whole organization. For example, it can lead to an increase in stock outs, costly emergency parts orders, missed PMs, collateral damage, manpower shortages and ultimately missed orders. Maintenance impacts reliability because it increases the time between repairs by optimizing the preventive maintenance program on an asset or system. The most common way to measure reliability is MTBF, which refers to the average time the asset functions normally before it fails. Maintainability rates are easier to predict and generally more accurate but reliability has a bigger impact on availability (long periods of improved reliability will lead to increased availability). Maintenance doesn’t impact availability directly; rather it indirectly impacts availability through maintainability and reliability. Why do maintainability, reliability, and availability matter? Traditionally, maintenance is seen as a cost centre—how much is the maintenance department being paid, and how much are they spending on parts and materials to keeping assets operating. But today’s environment calls for a more forward-looking approach. Rather than examining costs in the past, organizations need to be able to predict outcomes. Understanding how properly functioning systems and assets contribute to the bottom line is crucial for recognizing how important asset availability is to an organization. Since improvements to reliability and maintainability have a direct impact on system availability, leveraging this knowledge will help improve profits in the long run.